"A great creamy-smooth soup for cold winter nights. 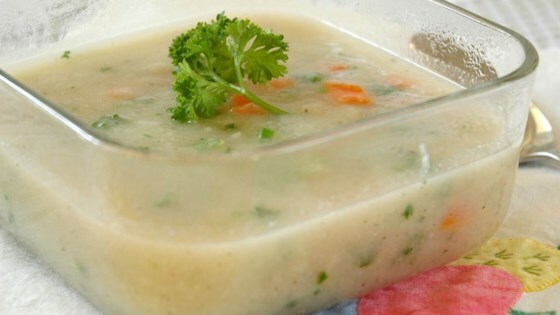 The thickness of the soup is determined by the proportions of cauliflower to water. Because different sizes of cauliflower are out there, add water if soup comes out too thick." Yum! I used less water and pureed the carrots along with the cauliflower, and it couldn't be any better. It seemed more of a great broth than a soup. I added 1 cup of cream, and 2 cups of bacon to give it more consistancy. Tastes great... just not a very "thick" soup. I simmered the vegetables in 3 cups of water, pureed them in the blender, then stirred in 2 cups of low-fat milk. The results were delicious!